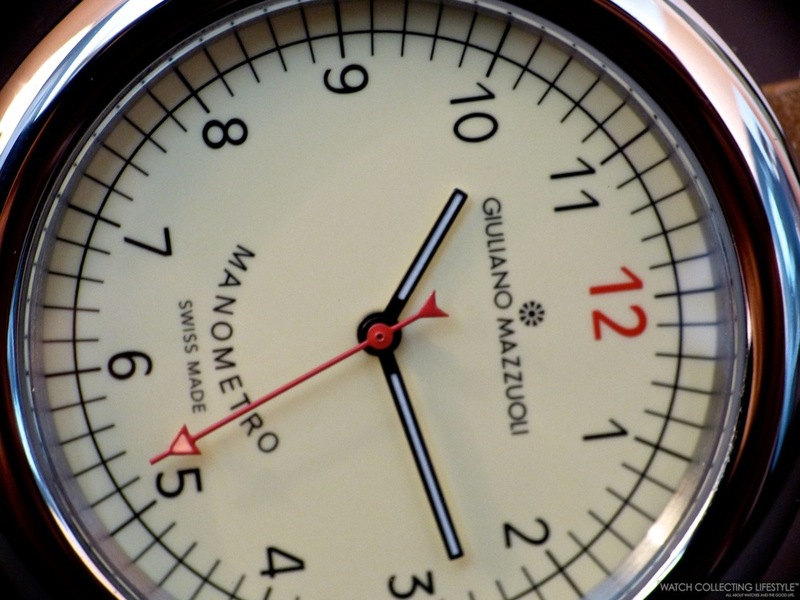 The Giuliano Mazzuoli Manometro is a watch that gets its inspiration from a manometer —tire pressure gauge. 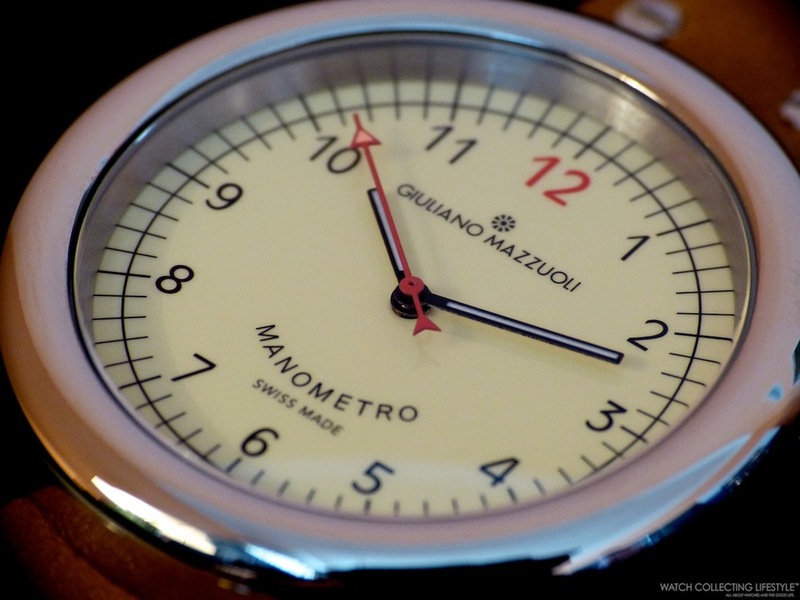 Giuliano Mazzuoli is an Italian watchmaker and inventor from Florence that comes from a legacy of bicycle makers, clockmakers and watchmakers. Giuliano's family was a prominent tower clock and long case clock maker in the 1700s. In the inventor's words, "There is nothing more difficult to design than simplicity, but one does not design simplicity. It is encountered like the way I encountered the manometro." His watches are designed in Italy but made in Switzerland to guarantee that the highest standards of watchmaking are met. This fascinating timepiece inspired by simplicity is a watch that one buys not to be recognized but for the mere pleasure of owning it. The Manometro is fitted with a simple rounded highly polished stainless steel case measuring 45.2 mm in diameter and 14.8 mm in thickness. A nice and thick crown is positioned at 2 o'clock making you feel like you are wearing a real manometer on a strap. 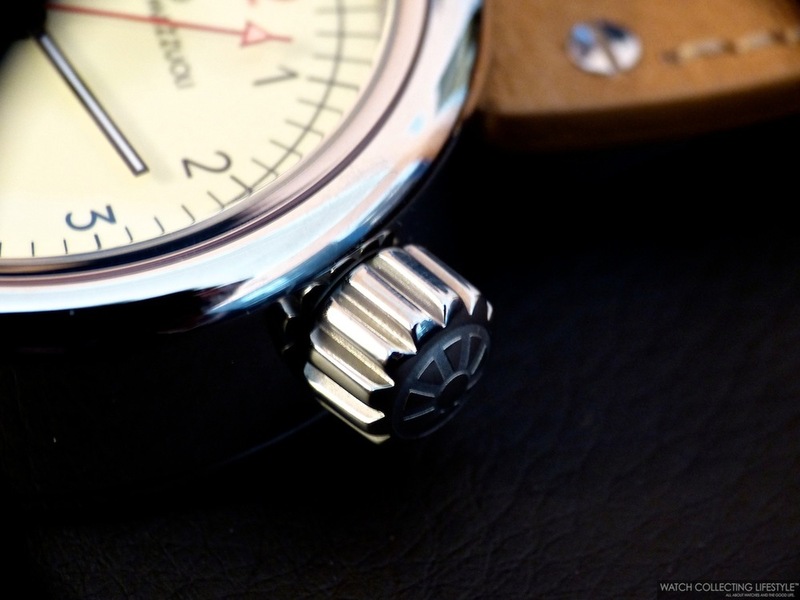 The simplicity and uniqueness of this watch is unlike any other watch we have reviewed recently. The Italian design of this timepiece is clearly perceived in every single component of the watch from the dial to the strap and everything in between. This unique timepiece is fitted with a gorgeous ivory dial with black Arabic numerals, a chapter ring, black minute and hour hands, a red seconds hand and a 12 marker in red in order to provide additional contrast. The dial is simple, clean and very well balanced. Fitted with an automatic ETA movement, the watch is solid, robust and reliable. The movement is protected with a screwed-in solid case back that is beautifully engraved with the timepiece's information. Nothing fancy, just simple and functional. The watch is fitted with a handmade —in Tuscany— natural color calfskin strap that is very nice, thick and quite comfortable. Due to the raw leather used on the strap, it will develop a nice patina over time showing more character as its color darkens. 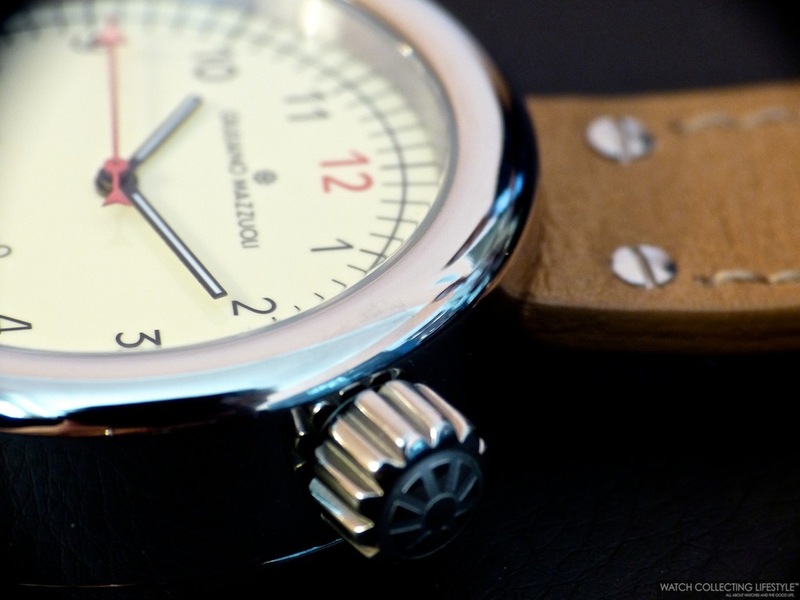 The strap is fitted with a pin buckle that is also very comfortable. As you can appreciate in the pictures, the strap is secured into the case by two screws. Additionally, there's a small stainless steel piece attached to the reverse side of the strap to guarantee that it molds correctly on the wrist. The watch wears extremely comfortably regardless of its thickness and somewhat bulky case. This timepiece is available in a variety of case materials including brushed stainless steel, titanium, carbon fiber, PVD gunmetal gray titanium and a combination of rose gold and titanium. The dial is available in ivory or black. If you want to wear a watch that very few own and become a trendsetter, this is a watch that will for sure become more popular over time. Glad we are the first ones to bring you this detailed review with live pictures. Sticker Price $3,500 USD. For more info on Giuliano Mazzuoli click here. Posted on October 18, 2013 by Editor & Publisher and filed under Other Brands, Giuliano Mazzuoli and tagged Giuliano Mazzuoli Manometro Posts 2013.